Many, many of my sincerest thanks go to Eileen San Juan and Nollie Arguelles of the Cagayan de Oro Hotel and Restaurant Association (COHARA), who have been instrumental in shaping the itinerary of my visit to the city. They have been wonderful hosts and industry experts with a wealth of knowledge on what to see, do and taste in Cagayan de Oro! According to written and oral sources, the etymology of sinuglaw is taken from the Cebuano term “sinugba” which means ‘to grill’, and the Tagalog “kinilaw,” akin to South American ceviche. I learned of the dish via Michaela Fenix’s book Country Cooking: Philippine Regional Cuisines, where she describes sinuglaw as “what stuck in my mind” in an essay about food from Northern Mindanao. The idea of enjoying barbecued pork - fat rendered, flame-kissed - mixed with zesty citrus and sushi-grade tuna in a single dish excited the hell out of me! 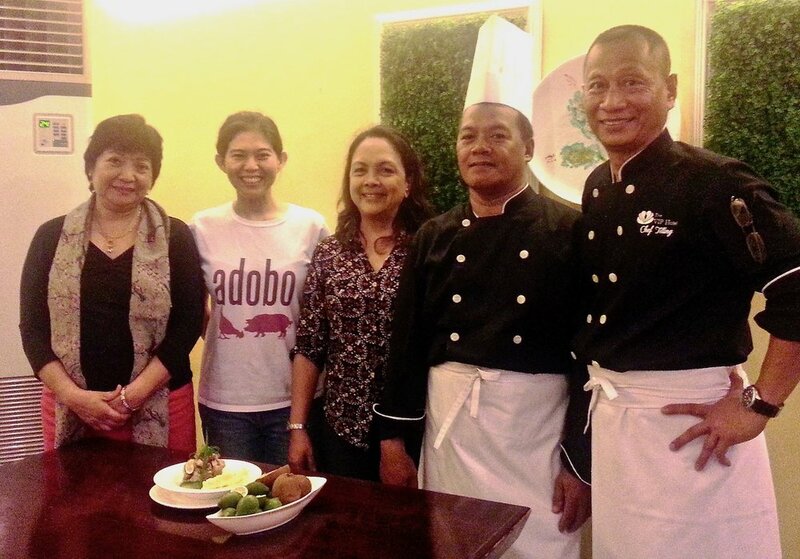 At Cee's Restaurant in the VIP Hotel, we met Chef Isidro Sobriano, a Cagayan de Oro native and long-time collaborator with COHARA, for lunch. “It’s a true Kagay-anon dish,” he said of sinuglaw, highlighting its consumption as an appetizer or entree (and naturally, as pulutan - a.k.a. delicious drinking fare). Knowing I had been eager to try this local specialty, Chef Sobriano had everything ready to go when we arrived. Laid out on a table were bowls of sliced suwa, scraped tabon-tabon fruit, chopped bird’s eye chilies, sliced green onions, julienned ginger, shallots and sweet red peppers, fresh tuba (coconut sap fermented for no longer than 2 days into a mild vinegar, the stage prior to becoming bahal), cubes of charcoal-grilled pork belly and chunks of fresh tuna, cut into perfect squares and tasting slightly saline on their own. 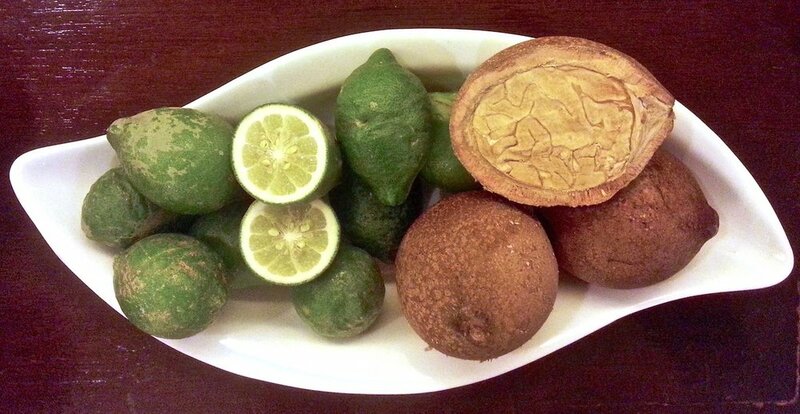 Fresh suwa is smaller than a North American lime in size, and tastes like a sweet calamansi - sour, but not puckeringly so. I squeezed some of the juice into my palm and it tasted like a Meyer lemon drizzled with honey. I wished there was a concentrate of suwa juice available for me to take home! The flesh of the tabon-tabon fruit was hard, mealy, and visually looked like a small brain split in half. With the edge of a spoon, I took a turn at scraping the flesh into coarse shavings, which looked like bonito flakes as they fell. Chef Sobriano then combined the tuna, pork belly, shallots, chilies, green onions, red peppers and suwa juice in a large mixing bowl. In a separate bowl, his sous chef combined the shaved tabon-tabon fruit with tuba vinegar, using two spoons to mash the fruit and vinegar into a milky pulp. I found it fascinating to see how quickly the compounds in the fruit turned a clear, crisp-tasting vinegar into a complex two-ingredient dressing, emulsified into a velvety sauce. Topped over all the other fresh ingredients, the dressing drapes over every piece perfectly - especially over the toothsome chunks of tuna, with their exteriors slowly being “cooked” by the acid, providing lots of surface area for the dressing to stick to. Then the heat of the chilies comes through, and the bite from the shallots and ginger brings everything together nicely. It’s an addictive thing to eat.